In this non-stop digital era, nothing can be more therapeutic than escaping technology and using our hands for something other than touching a keyboard or screen. Which may be why more and more people are turning to do-it-yourself crafts, such as sewing, wood working, beading and embroidery. In fact, nearly two-thirds of U.S. households participate in at least one crafting hobby. Riviera resident Cristina McKinnon, a life-long crafter, knows how fulfilling it can be to create homemade works of art. 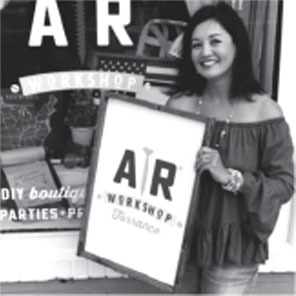 So when she was looking for a post-retirement career after 27 years as a public servant, she jumped at the chance to open her own craft studio, AR Workshop Torrance. Located in the remodeled shopping plaza at Anza and Pacific Coast Highway, AR Workshop offers all the supplies and instruction needed to create homemade gifts and décor, including knit blankets, charcuterie boards, frames, wood signs, canvas pillows, wood trays, tote bags and more. Customers flock there for birthday parties, corporate team building events, bridal showers and date nights. They even offer summer camp programs for kids. Cristina and her husband, Milt, moved to the Riviera more than a decade ago, after falling in love with the first house they saw. AR Workshop Torrance offers daily workshops that customers can sign up for, such as ‘Chunky Knit Blankets,’ ‘Wine-Down Wednesday Plank Workshops,’ and ‘Canvas Workshops.’ Customers are welcome to bring snacks, sips and sweets to enjoy while they create. To sign up for a workshop, or to reserve a spot for a private event, go to www.arworkshop.com/torrance, or call 310-893-7553. Be sure to take $10 off your next project by registering with code: TORRANCEGO (does not include specialty classes). AR Workshop Torrance is located at 24046 Vista Montana, Torrance. 0 Responses on "Riviera Resident Opens Craft Workshop: Reconnect With Your Creative Side"